Your tooth may be damaged by decay or trauma and must be removed. This is where Implant Crowns can restore your smile and give you back your confidence. Implants are used to replace the root of your tooth onto which a crown can be placed restoring the look and feel of your natural tooth. Westlake Hills Dentistry specializes in cosmetic and restorative dentistry. We can restore and repair your smile and give you natural looking and feeling solutions to your oral health issues. Our team of experts uses state-of-the-art digital imaging and CEREC® technology to craft your new crowns right in our office. We are the Austin’s area choice for Cosmetic Procedures! Dental implants have many benefits. Since no other teeth are involved, unlike bridges which must be affixed to adjoining teeth, your teeth are left intact. Implants feel and look natural. Your bite and speech are improved because once fixed in your mouth they don’t slide around like dentures can, and your confidence is returned because you have a new beautiful smile. First the doctor will go over your treatment plan with you and discuss your options and answer any questions you may have. If your tooth is still in place it will be removed and the root implant is placed. 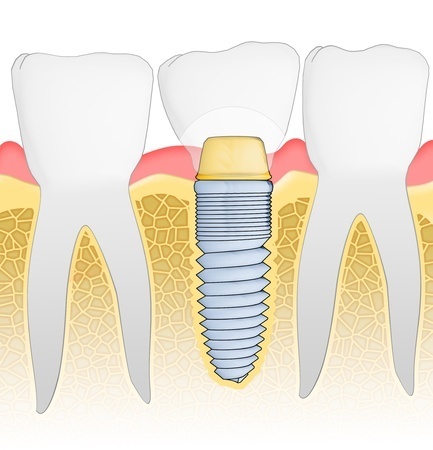 The tooth root implant is made of titanium and is placed into the bone socket of the missing tooth. As your jawbone heals the implant is anchored securely as the jawbone heals around it. The healing process takes about six to 12 weeks. After your jaw is healed you will return to our office and the doctor will take digital images and pictures of your tooth and surrounding teeth. An abutment, a small connector post, is attached to the implant to hold your new tooth in place. With the digital images a new crown is milled in our office using CEREC® technology and placed onto the abutment. You now have a new natural looking crown replacing the missing tooth. If you have more than one tooth to be replaced your dentist may craft a removable denture which is then placed onto the implant with attachments to support it. Your new teeth feel and look just like your natural teeth because with CEREC® technology the shape and color is matched perfectly to your natural teeth. 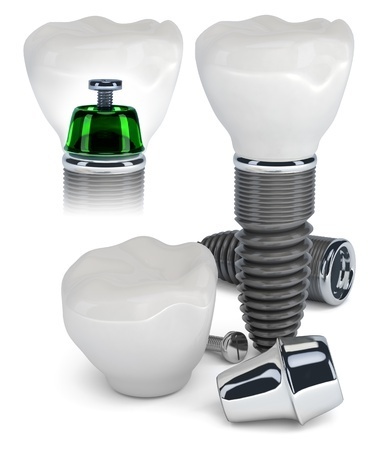 Implant crowns are strong and durable and will last for many years with proper care. For more information on dental crowns implants or CEREC® technology in Austin, Texas, contact Westlake Hills Dentistry today. Our offices are equipped to provide an array of restorative procedures such as porcelain veneers, dental implants, composite bonding, and tooth-colored fillings.